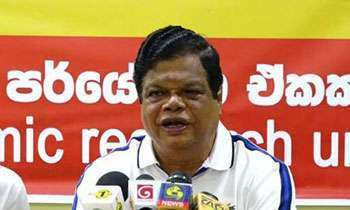 President Maithripala Sirisena’s decision to replace the Board of Directors of the Bank of Ceylon, People’s Bank and the BOI shows that these institutions are corrupt similar to the Central Bank in the past, joint opposition (JO) MP Bandula Gunawardana said yesterday. He said all these institutions were functioning in a manner that favoured certain individuals. “We are shocked to see the deplorable state of affairs in these State banks and the BOI. The Board of Investments has become a haven for mega deals while the two State banks have lost the people’s confidence,” the MP told a news briefing. The President has been in this game long enough to take unilateral and drastic decisions for the sake of the Country and don't want baseless reactive comments from people who are crying for their meal packet. You Bandula, is just like that foot in mouth Professor, just wind. Oops! That is nice logic "Doctor (?)". So during your regime there was no dissolutions and thus no corruption. Lovely is the pineapple toffee. YES THEY ARE CORRUPTED SO DISSOLVED.. YOU WANT IT TO BE RETAINED? AT LEAST HE DISSOLVED. YOU THINK RAJAKSHA WOULD DO THE SAME THING? So must we keep them like MR and all of you did? You pathetic politician! At least now there is freedom of expression and press can question these decisions. Would you have opened your mouth like this with MR - the curse of Sri Lanka. Sir, you are quite right, obviously, it is experienced by the public. Unfortunately, the members of corrupt group are those setting dissolution order. Yes who ever is corrupt must be thrown out and that what the people did for you as well. Now being the jealous opposition and making such statements is no solution for your party. JO-kers are a pack of liars, head is Bandula the Tuition master. Srilankan commission indicates how you were corrupt during your tenure.